Bruichladdich and I continue to have a mixed relationship. For every Islay Barley that I like, there’s a Black Art that I don’t; for every Octomore 07.1 (a delicate punch to the face) there’s a Octomore Discovery (aka Bacon and Death). However, even in this new era for them, with both Mark Reynier and Jim McEwan – the founding fathers of the rebirth of the distillery in 2000 – now out of the picture, I still have the inbuilt affection for them that most whisky geeks do. With the investment of new owners Rémy Martin backing them, they are embracing the digital world, and I was invited to join in with their latest venture – the Laddie Micro Provenance digital tastings, aka #LaddieMPx, for various values of x. Having sat on the sidelines for #LaddieMP1 and #LaddieMP2, I was finally able to take part in the third, the consistently named #LaddieMP3. Bruichladdich pride themselves on their ingredients, far beyond the point that their marketing and PR teams would ask them to. Their philosophy is based on traceability and terroir – whether you believe it exists for whisky or not – and not only do they want to track everything they can about their whiskies, but they pass that information on to the people who drink them, a relevant topic in today’s whisky enthusiast climate. The Microprovenance series is very much Bruichladdich doing their thing – a range of single cask whiskies, listing as much information about them as they can say without running out of space on the label. A variety of casks, finishes, ages, barley types, warehouse locations and many other variables, all combined to produce something unique and show the glorious inconsistency that producers fight against to create their regular expressions. #LaddieMP3, we were to discover, was all about casks. The digital side of the tasting was more than the now-common Twitter tasting, spreading itself across Twitter, a YouTube live stream, Periscope and, at least in my case, Instagram. 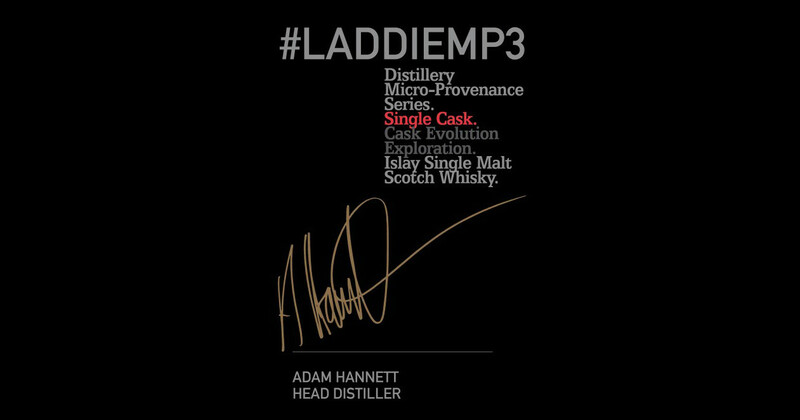 Now that YouTube offers an in-window chat alongside the live stream, Twitter felt a bit disconnected, but the amount of content that popped up on the #LaddieMP3 hashtag suggests that my experience was not necessarily the norm. Hosting the evening were head distiller Adam Hannett and digital marketing manager Lynton Davidson. We were tasting three whiskies, all of which appeared for sale on the Bruichladdich website after the tasting. However, our sample bottles – also available to buy as a pack, so that anyone could join in on the night – were more secretive than the production whiskies, only giving a cask number, so as to let us taste them all blind. Nose: Thick vanilla cream, apple and mango (both sweet and sour), honeysuckle and heather, mucky touches underneath – grain silage, hints of cowshed. Glacé cherries develop, topping Bakewell tarts with a buttery crust. Sharper notes hide at the back – tarragon, menthol and leafy green touches. Nice biscuits and more pastry build as it sits. Taste: Vanilla cream again to start, quickly pushed out of the way by fruit – the apple and mango from the nose, as well as pears and a touch of banana. With that is a lot of woody spice: clove, cardamon, white pepper and some sappiness. Un-brûléed creme – complete with caster sugar topping – candied lemon and some damp oak popping up at the end. Finish: Lots of spice and darker notes – liquorice and freshly cut oak – fading through damp oak before popping up again with menthol and vanilla. Just what you’d want to start a cask-strength whisky tasting – relatively approachable, sweet and fruity. This was revealed to be the oldest whisky of the evening – 1994 vintage spirit, matured initially in refill bourbon casks before being vatted and then filled into Sauternes casks for just over a year. Produced in the days before the distillery’s revival, this is a slice of what Bruichladdich’s spirit used to be like, combined with the ACEing ways of Jim McEwan – Jim is famously not a fan of the term ‘finishing’ when talking about whisky, considering it to be too negative, and prefers ACE instead: Additional Cask Enhancement. Nose: Very jammy and leafy to start, with blackcurrant jam tarts, menthol, lemon lockets and mulching grain. Red-wine-poached pears, cherry Soothers, ferns and pine needles. Pastry notes develop, with sour cream, and red and black Fox’s glacier fruits. Taste: Intense red medicine – the stuff I used to get given for colds as a child in the 1980s: liquid red liquorice, fake blackcurrant and an undercurrent of something worryingly medicinal. Green herbal background – throat lozenges, pine needles and damp fields of ferns. Lots of red boiled sweets of all flavours, and an intense sweetness of the most ruby of ruby ports. Finish: Cough sweets and blackcurrant Tunes, blackcurrant jam tarts and some green leaves. This was, as the creamy notes suggested to me, from the post-2000 distillation regime. Rather than the more floral style of the old production, new Bruichladdich usually has a lot of grain and a hint of sour, creamy notes, sometime picked out as ‘baby sick’: cream and a hint of acidic sourness. It was a 2003 vintage Laddie, matured in a port cask until earlier this year. Its intense pink colour backs that up and even if it was a fresh port cask, the amount of flavour it’s picked up from the cask’s previous occupant was impressive. From the flavour, I assumed it would have had something to do with ruby port – the red liquorice and medicinal notes are things I associate with the style. However, ruby is normally matured in large vats, which led me to assume that the whisky would have been from a cask that had been seasoned with ruby port, so as to emulate the casks that used to be used to transport wine to the UK from Portugal. However, I asked and was told that the cask was used to actually mature port, which throws up more questions – maturing port in casks isn’t the same as maturing whisky, more details here. In short: the cask once held port, let’s leave it at that. Nose: Cinder toffee, gunpowder, warm leather, green anise, tarragon and pine needles. Sulphury notes grow, bringing meatiness, gravel and salty liquorice. As the meatiness blows off, more green leaves and damp twigs appear, as well as sherry fruit and brown sugar. Taste: Big and strong. Leather and cherry jam becomes marzipan and Bakewells. Weightier sherry cask notes appear – liquorice, blackcurrants and the traditional raisins, as well as molasses-heavy brown sugar and some background struck match. Finish: Fresh mint and menthol is quickly swamped by toffee, black treacle and chocolate butter icing. A big sherried dram. Another 2003 vintage, this one had spent its entire life in a first-fill sherry cask. The style of sherry wasn’t known but distiller Adam reckoned it was probably oloroso rather than PX, due to the comparative lack of sweetness. Three very different whiskies, varying, for me, from excellent – I love old school Bruichladdich and the 1995 ticked all the boxes for me – to definitely not my thing – while the medicine of my youth has some fond memories, it’s not something I seek out to drink these days. But that’s what I expect from the distillery – something different and definitely theirs. Nikola Runev liked this on Facebook. But what does happen when you distill Lynton? Matt Bowdler liked this on Facebook. Previous PostPrevious Compass Box and the SWA: what’s happened and what can we do?